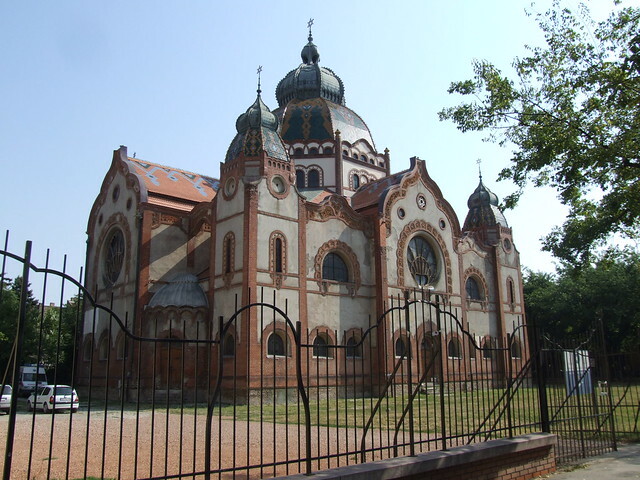 The Synagogue in Subotica was built in 1902, in what was then part of Austro-Hungarian Empire, to designs by Hungarian architects Marcell Komor and Dezsö Jakab. One of the finest surviving examples of Art Nouveau religious architecture, it has a unique concrete and steel structure coupled with decorative detailing from Hungarian Folk Art. Its huge central dome is surrounded by smaller domes on the four corners and there is a rich interior design of gilded plaster stuccoes, wall paintings and stained glass windows. It is acknowledged as a Monument of Culture of Exceptional Importance. At the time the Synagogue was built there was a large and prosperous Jewish population of some 3000. After World War II, the Jewish community became too small to sustain a building of this size but nonetheless the building remains of huge importance to the Jewish community locally and internationally. The building was used by the Subotica National Theatre for a number of years but is now empty, with visitor access only one day a week, and its condition has inevitably deteriorated. Over the years a number of grants have enabled various repair works to be undertaken to the building; regrettably not all have been undertaken effectively. As a result the building remains at serious risk and urgently needs a more strategic approach to the re-use of the building as well as a co-ordinated and appropriate programme of repairs both internally and externally. The nomination for ‘The 7 Most Endangered’ 2014 was made by Europa Nostra Serbia.